Tropics. The Beginning of the End of the Journey. A fascinating female character wakes up from the lethargy of a grey, humdrum life and sets out on a trip to the most exuberant and colourful parts of Asia. The difficult decision to break with the past will give way to a long journey of thought, memories and encounters with an endless line-up of characters that will define the protagonist’s present and future. 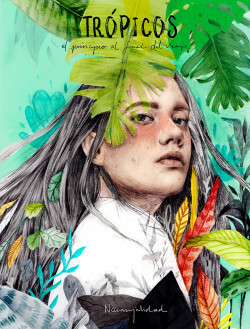 This is the story of a journey of initiation and transformation, peppered with unforgettable faces and situations as recorded in incredible illustrations by Naranjalidad: sheer beauty to delight the eyes and heart.